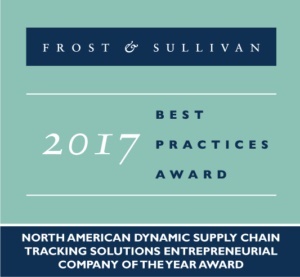 Helping to plug the holes in freight visibility for shippers and 3PLs earned FourKites, Chicago, the 2017 North American Dynamic Supply Chain Tracking Solutions Entrepreneurial Company of the Year Award from Frost & Sullivan, which lauded the company’s efforts to build a software platform to modernize information sharing within the logistics industry. Essentially, the company “scrape” data from different sources to provide shippers and 3PLs real-time visibility of their shipments regardless of the type of data, explained Craig Fiander, senior vice president, global business development. Establishing relationships with the carriers a shipper uses, FourKites’ platform is able to integrate carrier dispatch and GPS information to provide visibility of shipments. In addition to working with shippers, the company also provides a carrier portal built to upgrade EDI 214 infrastructures with real-time tracking data and geo-fencing. This allows carriers provide load information to customers without the need for check calls. The software uses a proprietary algorithm to calculate accurate ETAs. FourKites has built relationships with most major TMS and mobile communications providers, allowing them to provide accurate visibility no matter what system a carrier or shipper may be using. For carriers, the system can be easily integrated into the company’s existing dispatch, Fiander said, making deployment quick and easy. In the case where a carrier is hauling multiple loads, carriers can give their customers access only information on their specific load. In other words, if a truck delivers a load to store A and then delivers to store B, the shipper for store B will only see the information regarding his load, explained Dan Buchholz, FourKites solution engineer. The platform can be used on any mode of transportation – truckload, LTL, intermodal, etc., Buchholz said. For shippers, this capability is very attractive as it allows them to follow their shipments regardless of where they are or what they are on. For more information, check out www.fourkites.com.